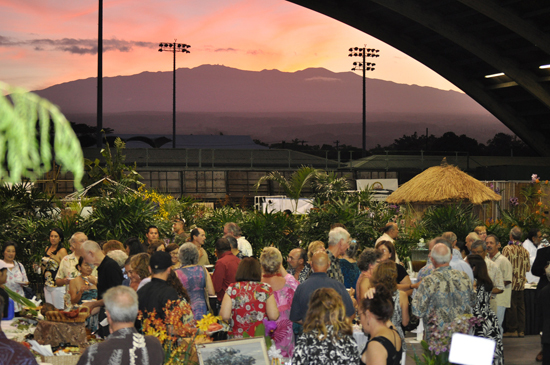 The Hilo Orchid Society presents a benefit Preview Party to kick off its 60th anniversary Orchid Show and Sale at the Edith Kanakaole Stadium. Slated for 6-9 p.m. Thursday, Aug. 2, the gala event features drinks, food, music, and orchid pre-sales. Food will be available at various serving stations compliments of Island Naturals and AJ & Sons Catering, featuring the food stylings of Audrey Wilson. A cookbook author, Wilson writes a weekly “Let’s Talk Food” column for Hawaii Tribune Herald. Proceeds of the Preview Party benefit both the Hilo Orchid Society scholarship fund and the non-profit Kuikahi Mediation Center. The Hilo Orchid Society scholarship fund offers financial assistance to students of tropical agriculture at the University of Hawaii at Hilo. Kuikahi Mediation Center provides affordable dispute prevention and resolution services to the East Hawaii community. Song recommends buying tickets early because they expect to sell out. “We want to ensure a fabulous, satisfying experience for all our guests,” she said. Tickets for the Preview Party are $65 ($25 of which is tax deductible) and may be purchased in advance from The Most Irresistible Shop on bayfront at 256 Kamehameha Avenue or Ku‘ikahi Mediation Center in The Hilo Lagoon Centre at 101 Aupuni Street, Suite PH 1014 B-2. Or call Linda Levine at (808) 963-6306 or Julie Mitchell at (808) 935-7844 x 116.